The one thing people are most surprised about with our wedding was the fact that we hosted it inside our home. In the beginning of the planning process we had looked into the option of doing it where I’m from in California. But as we started thinking about it more, we began to talk ourselves out of that option. We wanted our wedding to represent who we are as a couple, and nothing represented that more than this home of ours since we really have poured our hearts into it. We really wanted an ultra-small event. 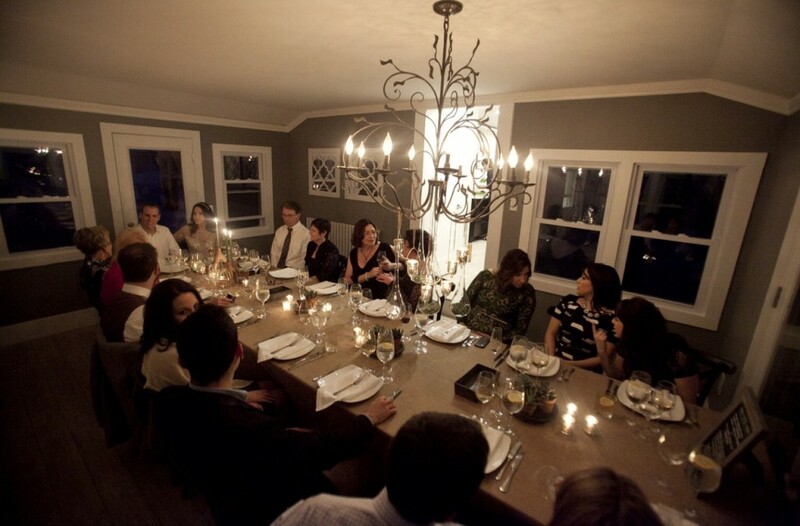 If we hosted the wedding ceremony inside our home, it would need to be less than 20 guests. That meant we made really tough decisions on who would be receiving an invite. We agreed on a rule to only invite guests that have met us both, so no strangers, and also only invite people who really needed to see us say our vows. Regardless of whether it’s a big wedding or not, there are always the feeling of excluding people when you are writing up a guest list. We opted to clear all the furniture out of our living room and dining room to make way for rentals. We wanted everyone to be comfortable, and we also wanted people to be able to relax in a cohesive environment. We brought in benches for the ceremony, and a large dining table for a family style dinner. We decided to host a winter wedding. All of our guests were traveling in from out of town, so that meant if there was a blizzard or other flight delays everyone would be in the same boat. And since we weren’t dealing with a venue, we had the flexibility to adjust the date or time if we needed to. Plus, the weather in New England is so wacky, I would have hated to have my heart set on an outdoor wedding in spring only to be pushed into a tent by bad weather. Having a small wedding is the same as having a small party. You want your guests to be able to drink and enjoy themselves without having to worry about driving. We set up a driver for the day to shuttle our loved ones from their hotels to our home; which meant no one got lost, no one was late, and no one had to be a designated driver. With all of that in mind, we had a successful wedding.